Built in 1924, Washington-Lee High School, named after two Virginians: President George Washington and Confederate General Robert E. Lee, has currently undergone a complete reconstruction. Counsilman-Hunsaker teamed with Grimm & Parker Architects to design the natatorium that includes an instructional pool and a 10 lane regulation NCAA short course swimming pool (with optional 25-meter lanes). 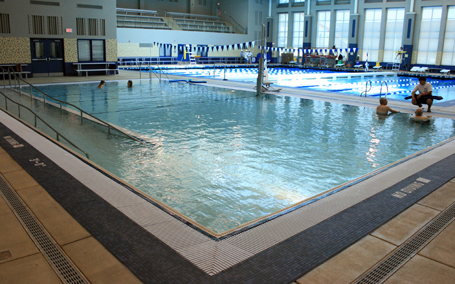 The 25-meter by 25-yard competition pool is equipped with two 1-meter springboards and a moveable bulkhead, allowing set up for water polo games and to separate the diving well and instructional areas from the lap lanes. A Colorado Timing System/Scoreboard displays swimmers’ names, lanes, times, and other relative information, while 175 spectator seats overlook the two pools. This facility is pursuing Leadership in Energy and Environmental Design (LEED) Silver Certification.